It may look like a soundstage, but its a counter-service restaurant. Hungry? Welcome to Hollywood & Dine! Heres your opportunity to dine in a Hollywood soundstage building that takes you back to some of the legendary eateries from the Golden Age of Hollywood. Youre not just at a food court; youre in the movies at the Hollywood & Dine. Well, this is a food court, but it isnt an ordinary food court. Youll choose your meal from four distinctly different counters, each based on a historic Hollywood eatery—places at which Hollywood stars liked to unwind when they werent in front of a movie camera. 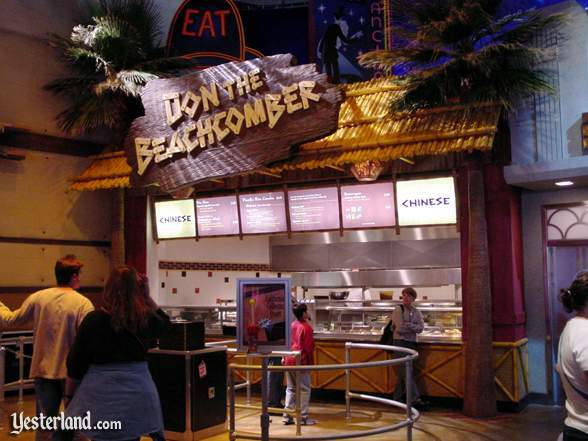 Don the Beachcomber serves Chinese food at the Hollywood & Dine. From left to right, the first of the four counters is Don the Beachcomber. Create your own Pacific Rim Combo for $8.99 by choosing two items from the menu board: caramelized chicken, orange peel chicken, kung pao chicken, Schezwan beef, beef and broccoli, and vegetarian egg roll. Not that hungry? Just order a single vegetarian egg roll for $4.29. The real Don the Beachcomber restaurant is credited with launching the Polynesian (or “tiki”) lounge fad that swept the U.S. mainland in the 1940s and 1950s, although rival Trader Vics also gets some of the credit. Former bootlegger Donn Beach (1907-1989), who was born Ernest Raymond Beaumont Gantt, opened a bar called Dons Beachcomber on Hollywood in 1934. Then, in 1937, he opened his first Don the Beachcomber restaurant across the street from the bar. The Cantonese food was considered exotic at the time, but the restaurants real fame came from the tropical rum drinks that Don the Beachcomber introduced, such as the Zombie, Beachcombers Gold, Missionarys Downfall, and Navy Grog. Don the Beachcomber and Trader Vics both claimed to have invented the Mai Tai, the most famous tropical drink of all. Alas, there are no tropical rum drinks at the Hollywood & Dine version. 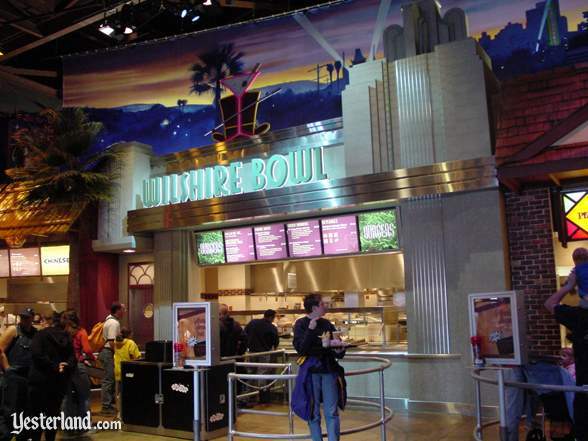 The Wilshire Bowl at the Hollywood & Dine is the place to get burgers. Your next choice is the Wilshire Bowl, specializing in burgers and chicken sandwiches. Try the cheddar & bacon burger for $6.79, complete with fries. For a chicken sandwich, take your pick of crispy or grilled; either way, its $6.49 including fries. The design of the Wilshire Bowl is based on the Wilshire Bowl nightclub—not a bowling alley, despite the name—which opened in the 1930s at 5655 Wilshire Boulevard on Los Angeless Miracle Mile. Jack Benny often mentioned the Wilshire Bowl during his popular radio show. In 1943, boxing champion and actor Max “Slapsie Maxie” Rosenbloom (1904-1976) turned the striking art deco building into Slapsy Maxies, one of the top nightclubs in the city. 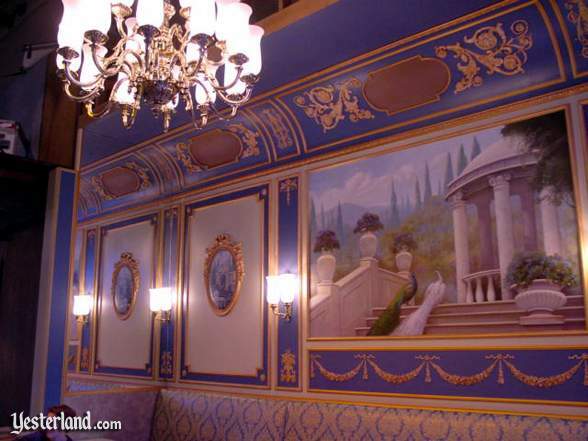 Villa Capri at Hollywood & Dine resembles the Hollywood original. How about a gourmet pizza? Perhaps with a salad? Choose from four-cheese, pepperoni, vegetable, or BBQ chicken pizza. The prices range from $5.19 to $5.69 for an individual pizza. Add a side caesar salad for $3.29. Or make a meal of a grilled chicken Caesar salad for $8.29 or an antipasto salad $7.99. The actual Villa Capri restaurant opened in 1957 at 6735 Yucca Street in Hollywood, just around the corner from the first Don the Beachcomber. Co-owned by Frank Sinatra, the restaurant featured Italian specialties. After a quarter century of catering to celebrities, Villa Capri closed in 1982. The building that housed the Villa Capri was torn down in August 2005, despite efforts by preservations. The people behind the counter are sandwich makers, not pharmacists. Theres one more counter. Schwab’s Pharmacy serves soups, traditional deli sandwiches, and side salads. Start with chicken noodle soup or corn bisque for $3.99. Choose one of the traditional sandwiches: roast beef, tuna salad, California club, ham & turkey, or pastrami. Sandwiches are $7.49 or $8.99. Add a side for $1.79 potato salad, cole slaw, cucumber salad, or pasta salad for $1.79. 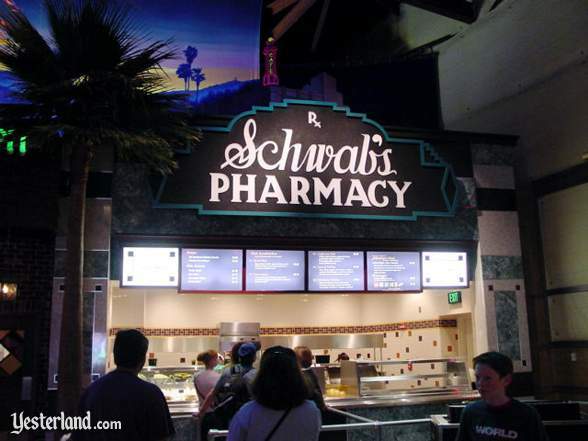 The real Schwab’s at 8024 Sunset Boulevard in Hollywood is most famous for the legend that Lana Turner was discovered sipping a Coke at Schwabs and quickly signed to a movie contract. It doesnt matter that Hollywood High School teenager Lana Turner was actually discovered at Hollywoods Top Hat Cafe. Schwab’s remains the drug store of legend. However, movie moguls and movie stars really did sit at the counter of the conveniently located Schwabs Drug Store for coffee, light meals, and ice cream. Schwabs closed in 1983 and the building was torn down in 1988. Take your food to a cash register. Theres never a problem finding a table at Hollywood & Dine. You can sit at an ordinary table if you wish, but there are better choices. 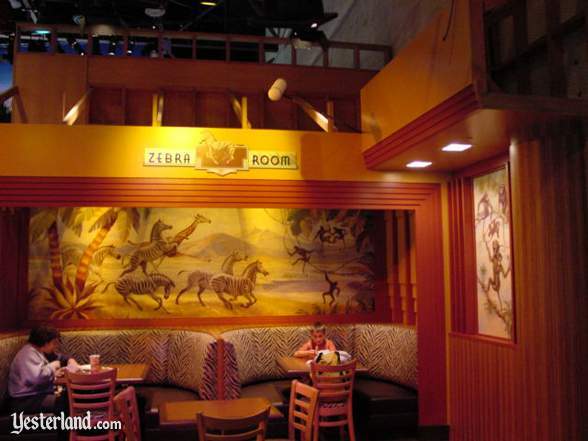 To keep the atmosphere going, sit in a Zebra Room booth. Look for the tables and booths that capture the look of famed restaurants and nightclubs such as Ciros, the Victor Hugo Restaurant, the Zebra Room, and Don the Beachcomber. The Victor Hugo Restaurant decor offers opulence fit for French royalty. Theres also plenty of seating outside. If its a nice day, you may want to take your tray outside. 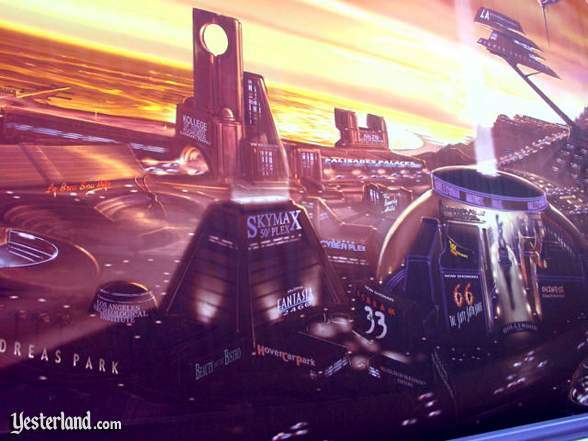 Take a look at Hollywood of the Future mural against the wall. Fantasia 2460 is playing at the Skyplex. The mural seems out-of-place on the wall of Hollywood & Dine, but there must be a good reason for it, right? A studio runner appears to have abandoned his utility bicycle. The movie studio theme doesnt end outside the Hollywood & Dine, although the theme of legendary restaurants is only inside. Random movie props are lined up outside. 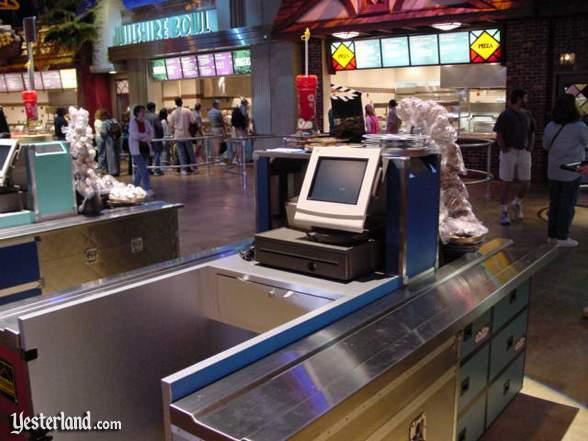 When Disneys California Adventure opened to the public on February 8, 2001, the Hollywood & Dine food court was ready to serve the masses. The masses never showed up. 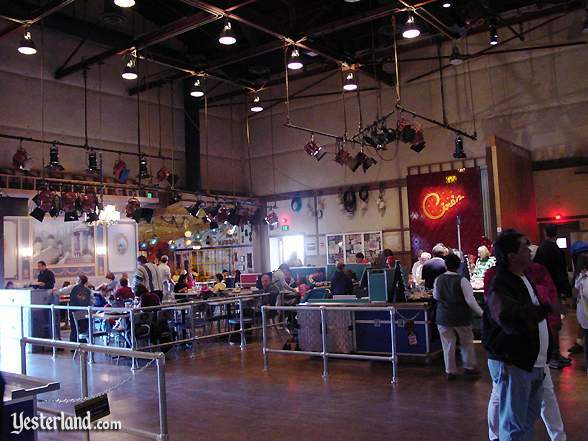 Disneys California Adventure had too many places to eat and too few guests. 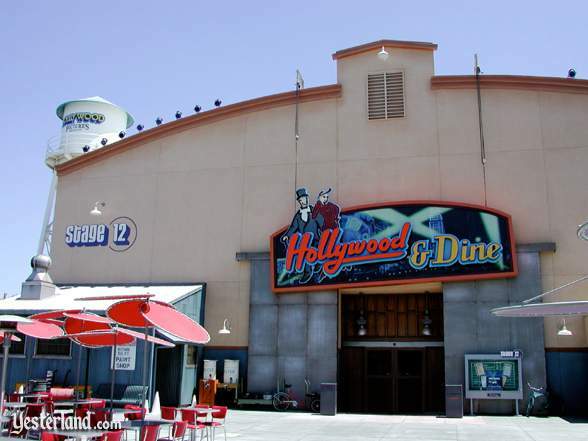 Hollywood & Dine was stuck in a dead corner of the park beyond the poorly received Superstar Limo attraction. The $8.49 tuna salad sandwiches and $4.29 vegetarian egg rolls didnt do anything to generate “you gotta go there” word-of-mouth. The theme didnt try to take guests back to the Golden Age of Hollywood. Instead, the theme was supposed to be a contemporary movie studio that happened to be making a movie about the Golden Age of Hollywood. But the “sets” didnt look like real movie sets that would be believable in a real movie. So Hollywood & Dine wasnt convincing on either level. Within the parks first year, guests found Hollywood & Dine locked—a victim of some of earliest cost cuts at Disneys California Adventure. At some point, the temporary closing became permanent. The sign remained in the front of the building into 2005. 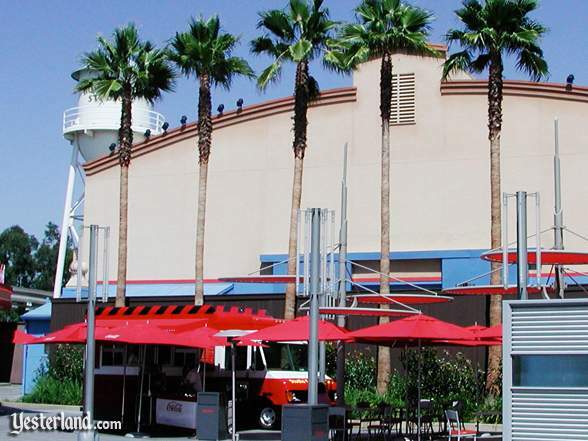 In late 2005, when the Hollywood Studios Backlot was fixed up for the opening of Monsters, Inc.: Mike & Sulley to the Rescue!, Disneys California Adventure finally made Hollywood & Dine look like a studio building in the background, instead of a shuttered restaurant. 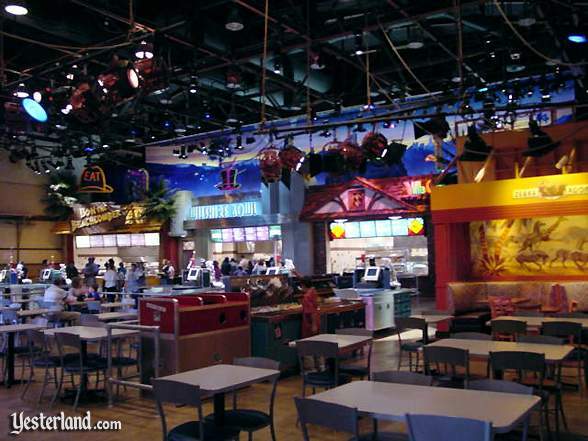 Hollywood & Dine, as it looked in 2001 and 2002. 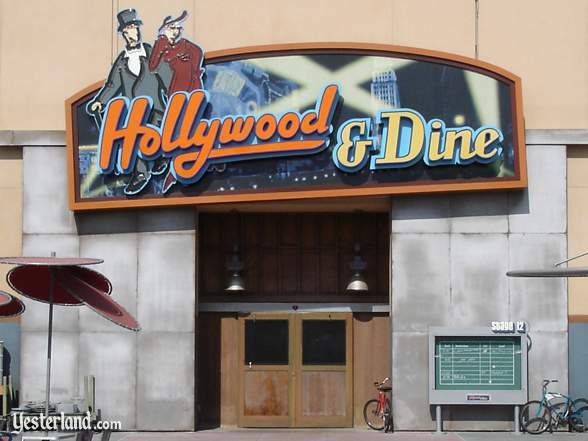 Photograph of Hollywood & Dine entrance sign: 2005 by Allen Huffman. 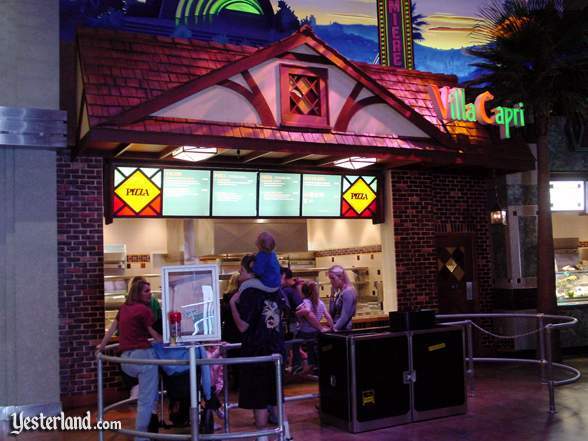 Photograph of Hollywood & Dine interior: 2001 by Allen Huffman. Photograph of Don the Beachcomber at Hollywood & Dine: 2001 by Allen Huffman. Photograph of Wilshire Bowl at Hollywood & Dine: 2001 by Allen Huffman. Photograph of Photograph of Wilshire Bowl at Hollywood & Dine: 2001 by Allen Huffman. Photograph of Schwabs Pharmacy at Hollywood & Dine: 2001 by Allen Huffman. Photograph of pay station at Hollywood & Dine: 2001 by Allen Huffman. Photograph of interior seating at Hollywood & Dine: 2001 by Allen Huffman. Photograph of Zebra Room seating at Hollywood & Dine: 2001 by Allen Huffman. Photograph of Victor Hugo seating at Hollywood & Dine: 2001 by Allen Huffman. 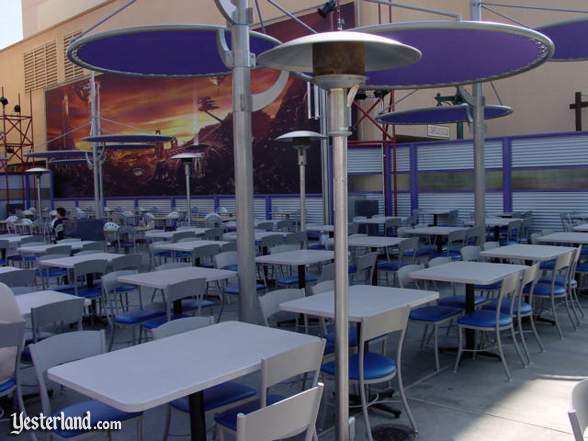 Photograph of outside seating at Hollywood & Dine: 2001 by Allen Huffman. Photograph of mural detail at Hollywood & Dine: 2001 by Allen Huffman. 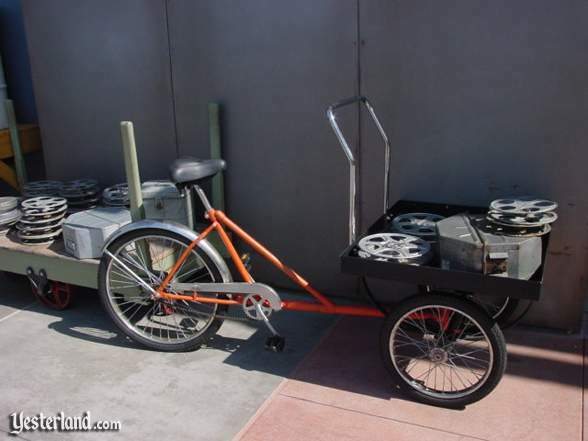 Photograph of studio bike at Hollywood & Dine: 2001 by Allen Huffman. 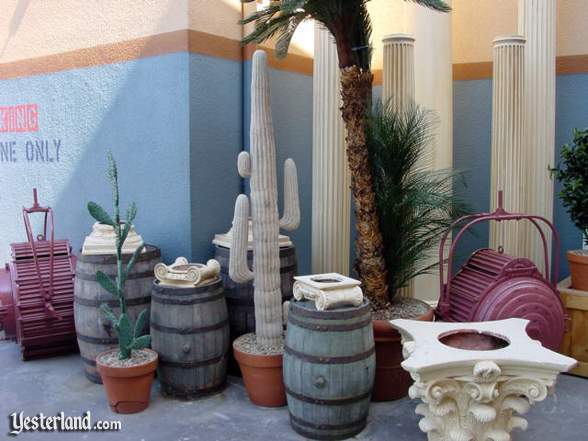 Photograph of studio props at Hollywood & Dine: 2001 by Allen Huffman. Photograph of Hollywood & Dine exterior (repeat of first photo on page): 2002 by Werner Weiss. Photograph of exterior of former Hollywood & Dine: 2006 by Werner Weiss.